Defying expectations seems to be the Cal Poly volleyball programs’ motto this year, with sophomore Torrey Van Winden as the integral centerpiece of it all. After transferring from UCLA, Van Winden not only helped bolster the indoor team to a record-breaking season but was also a key player on the beach for the Mustangs. She and her partner, freshman Tiadora Miric, led the Mustangs to a 27-7 overall record and a No. 4 national ranking. As the number one pair, they went 19-8 during the season with six victories over nationally ranked opponents. Their success was rewarded earlier this month, as the two were named American Volleyball Coaches Association (AVCA) All-Americans May 17. The recognition comes on the heels of the pair’s selection to the All Big West First Team one week earlier. She also earned an AVCA Honorable Mention All-American for indoor in December. But the accolades don’t end there. Each team gets the opportunity to send a pair or two to the USA Volleyball Collegiate Beach Pairs Championship. Van Winden was chosen with sophomore Emily Sonny. Van Winden’s season-long partner Miric was not eligible to play in the tournament because she is from Canada and only has Canadian citizenship. Sonny, however, is no stranger to success on the beach and was a nice fit as Van Winden’s partner. Sonny played alongside junior Samantha Manley the entire season mostly in the second position, recording a 29-5 record with four of those victories coming in the first position. 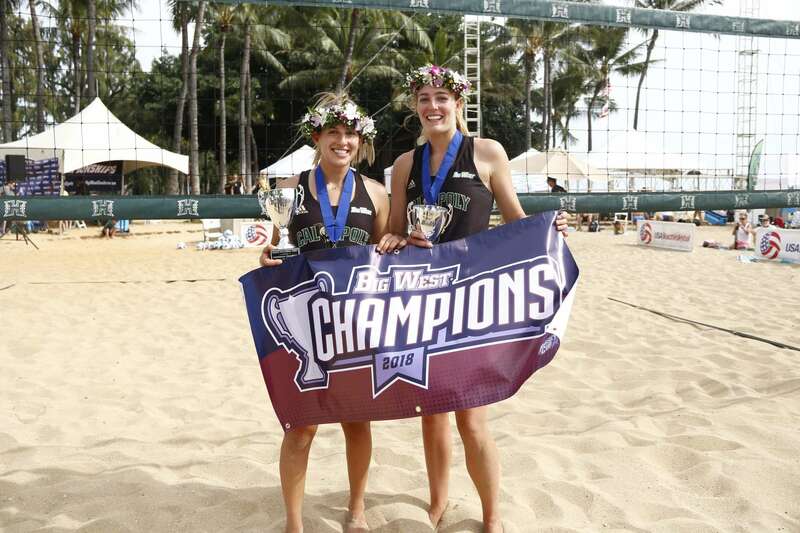 “Neither of us have either played defender in beach volleyball in our lives,” Van Winden said. This caused a shift defensively. Instead of the defender always staying back to defend, whoever served would defend and the other would stay at the net to block. It proved to be a disadvantage against teams with exceptional attackers who could pick on their weaknesses on defense. The pair won their pool, defeating pairs from UC Berkeley and Pepperdine. In playoffs, they defeated UNC-Wilmington handily, sweeping them 21-10 and 21-11. They went on to defeat the Pepperdine duo again in three, coming back from a 5-9 deficit in the third set. They fell in the semifinals to LSU, the eventual champions, and then went on the defeat one of Florida State’s two pairs by the scores of 25-11 and 25-23 to take bronze.